Macular degeneration is a disease of the macula portion of the retina. The macula is responsible for our clear central vision that we use for reading, watching TV, driving, and etc… The cells of the macula degenerate in many people as we age. 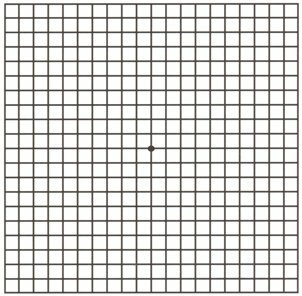 As the cells degenerate in the macula, the vision becomes blurred and/or distorted. Macular degeneration is the leading cause of permanent blindness in the United States in people over age 65. There are two types of macular degeneration dry and wet. In dry macular degeneration, the cells slowly degenerate over time causing the vision to slowly decrease. At this time there is no treatment for dry macular degeneration. There is a large AREDS study that showed taking high doses of certain vitamins can slow down the progression by 20 to 25 percent. Omega-3 fatty acids may also help in slowing the progression. There are several drugs in FDA studies that may help with dry macular degeneration if found to be safe and effective. 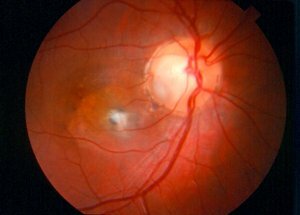 Wet macular degeneration is characterized by abnormal blood vessels growing under the macula and bleeding and/or leaking fluid into the macula. 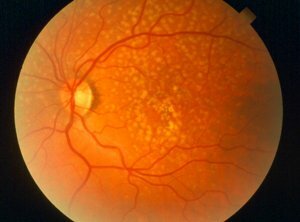 This can occur suddenly compared to the slow progression of dry macular degeneration. This can rapidly lead to significant loss of vision and eventually legal blindness. There are several treatments available for wet macular degeneration. The abnormal new vessel growth is stimulated by vascular endothelial growth factor. This class of drugs reduces or shrinks the abnormal vessels. The medication is injected into the vitreous humor in the back portion of the eye. This is usually done on a monthly basis in the beginning. Once the macula is dry, the injections may be given less often. 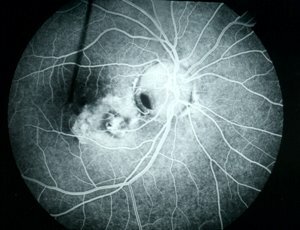 Laser photocoagulation was used in the beginning to treat wet macular degeneration but is not used in most cases as it destroys the retina where the treatment is applied. It cannot be used in the foveal area of the macula because of this side effect. Photodynamic therapy utilizes Visudyne or generic name verteporfin to treat the abnormal vessels. The procedure involves injecting Visudyne into a vein. The drug is absorbed by the abnormal vessels in the macula. Visudyne is a light-sensitive drug. A low intensity non-burning laser is applied to the retina. The light activates the Visudyne which shrinks the blood vessels. There are several treatments available for wet macular degeneration. There are many studies of drugs and treatments being conducted at any one time for dry and wet macular degeneration. You can go to the FDA government web site to see these trials at www.clinicaltrials.gov and search for macular degeneration.